How is a Support Officer’s workday? The company has a bright and well-located office in a brand new “skyscraper”. A team of colleagues from all over Europe work together to put together the best casino and betting experience on the market. 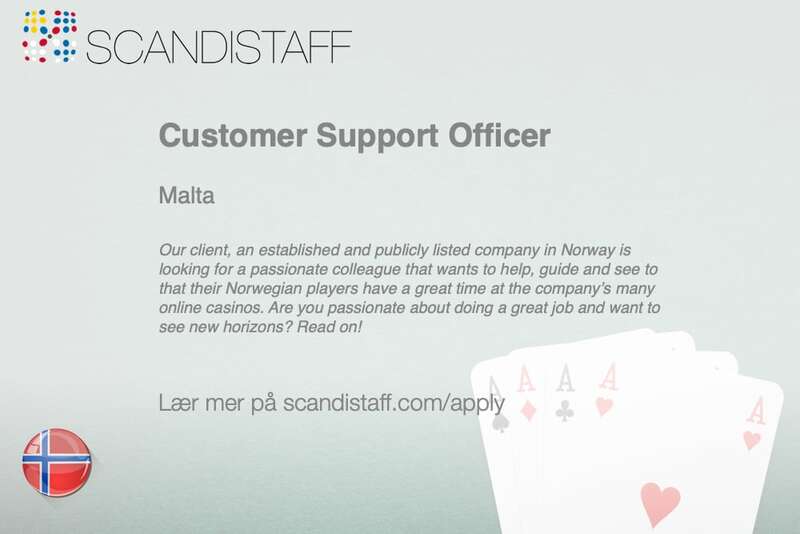 As part of the customer service department and in particular, the small Norwegian team will you be helping the clients with queries related to accounts, payments, promotions, KYC and technical issues. Via email and chat are the players contacting the company when they have problems ranging from opening up an account, trying to deposit/withdraw money or experiencing difficulties with browsers, slots or uploading documents. You’ll be representing all the company’s brands that are active in the Norwegian market which means that you’ll sometimes be managing several chats at the same time. We really appreciate employees that think one step further and comes up with ideas, suggestions for improvement and general feedback on matters that can be adjusted to better suit the organisational goals. What is most important is that you have a nice tone of voice (in writing) and understand the Norwegian peoples’ culture and how to treat them in a great way so they feel welcome, special and experiencing a great gaming experience. The customer service department doesn’t just solve problems, it makes the players choose to play at the company’s casinos over any other. Who is our new Support Officer? We are looking for someone that’s ambitious, takes pride in his/her work and that is ready for a challenge and adventure of a lifetime. Naturally, you’ll need to be native in Norwegian and fluent in English (a small number of contacts will be in English). If people have told you that you are friendly, empathic and results-oriented are you most likely the one we are looking for! It’s, of course, a merit if you’ve worked with online customer service previously but what is most important is your personal attitude, ambition and motivation. There will be a lot of cross-department collaboration so be prepared to be in touch with colleagues outside of the customer service department and do some great teamwork to make the customer experience flawless. We offer permanent full-time employment (40h week) with two shifts (no night shift at the moment). The company offers a higher salary than the industry average and an attractive bonus which equals to 2 months’ salary (paid yearly). Benefits such as gym membership (or classes), Friday Beers and fun events are also offered. Do you want to be the Support Officer?